Could your adrenals be the missing key to better health? In the thyroid world there is no shortage of discussion about adrenal problems. We know that healthy rhythms of cortisol are essential to the repair of your thyroid but how can you get healthy rhythms? The first is always treating the cause. Why are they unhealthy to begin with? There is a concept that if your adrenal function is not healthy it is because your glands are tired. One author said that adrenal fatigue is a condition that is a mild form of adrenal insufficiency, also known as Addison disease. Here is where the conventional world protests and says there is no such thing as mild Addison disease or adrenal fatigue. They are partially correct. Addison disease is one in which the adrenal glands quickly become damaged by the immune system. It is a condition in which your body is asking the adrenal glands to work but they cannot. 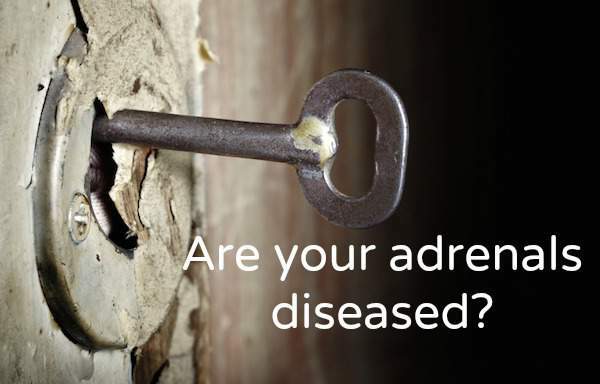 Addison disease can be diagnosed by a complete lack of cortisol production and antibodies attacking the adrenal glands. There is a very real condition that medical research refers to HPA (Hypothalamic Pituitary Adrenal) dysfunction. I refer to it as adrenal dysfunction for simplicity. It differs from Addison disease in that, along with being too low, cortisol may be too high or timed poorly and there are no recognized signs of adrenal autoimmunity. How do you have adrenal disease or adrenal dysfunction? If you have had your cortisol tested and is low, but not flatlined, erratic, or high, you do not have adrenal disease. If it is very low, the next step is to test adrenal antibodies and your pituitary feedback signal to the adrenals, called the ACTH. If the antibodies and the ACTH are high and your cortisol is close to none, you likely do have adrenal disease. Why is this distinction so important? In adrenal disease, your body wants cortisol but can’t get it. Taking cortisol, or equivalents of it is essential to regain health. In adrenal dysfunction, your body is able to produce cortisol but does not want as much as normal, or cannot effectively regulate it. In these cases, taking cortisol is rarely of long term benefit. Adrenal disease is rare, but if you suspect it, work with an experienced physician. Adrenal dysfunction has 3 very different levels with different needs. Use your level to chose the best adrenal tonics. Avoid sugar, caffeine, and alcohol. Avoid gluten and other foods you may be intolerant to. Healthy adrenals can be as simple as carb-cycling. Read my book The Adrenal Reset Diet for more ideas. Start each day with ½ hour of sunlight or 10,000 lux from a light box . 1 hour before bed turn off all electronics and all lights besides a red bulb in a reading lamp. Dr. Alan Christianson is a Phoenix, Arizona-based Naturopathic Physician who helps people overcome adrenal and thyroid disorders and achieve lasting fat loss and vibrant energy. He is the author of the bestselling The Complete Idiot’s Guide to Thyroid Disease , Healing Hashimoto’s: A Savvy Patient’s Guide , and The Adrenal Reset Diet: Strategically Cycle Carbs and Proteins to Lose Weight, Balance Hormones, and Move from Stressed to Thriving .